My first trip to Sri Lanka was a revelation in all possible meanings. I knew close to nothing about the country, its history, its people and its food upon arrival. So I had to learn everything the hard way: through unparalleled personal experience. For example, after taking my first trip to the market in order to buy some exotic fruits I ended up throwing away an unripe avocado that I peeled and tried to bite into as if it was an apple. In my defense: I had never had avocados before and had no idea how it should be eaten. I also realized that some of my beliefs were complete nonsense. I imagined that after a couple of months of fresh fruits and veggies diet (it’s tropical island we are talking about, right?) I will lose some weight. In reality as soon as I arrived I found myself following the rice and curry diet that resulted in me gaining 6 kilos in under 2 months. And I won’t even mention how many times I cried trying to finish my lunch or dinner, because you see, saying “less spicy, please” seems to work only every third time in Sri Lanka. Below I described some distinct features of Sri Lankan cuisine and my tips on how to eat well. If you are looking for non-food related information, read Drifter Planet’s tips for traveling Sri Lanka (from transportation to banks to common scams and beyond). Coming from Russia where Asian food is extremely unpopular my only definition of curry was a spice blend. In the first days I found myself very confused when asked if I want to have rice and curry. For those of you who haven’t traveled to Asia and don’t frequent Indian restaurants: curry is a name for most of the dishes served along with rice that are cooked with spices (including chili, curry powder and curry leaves) and often in gravy. Rice and curry is the king of Sri Lankan food and you are very likely to eat it every day. 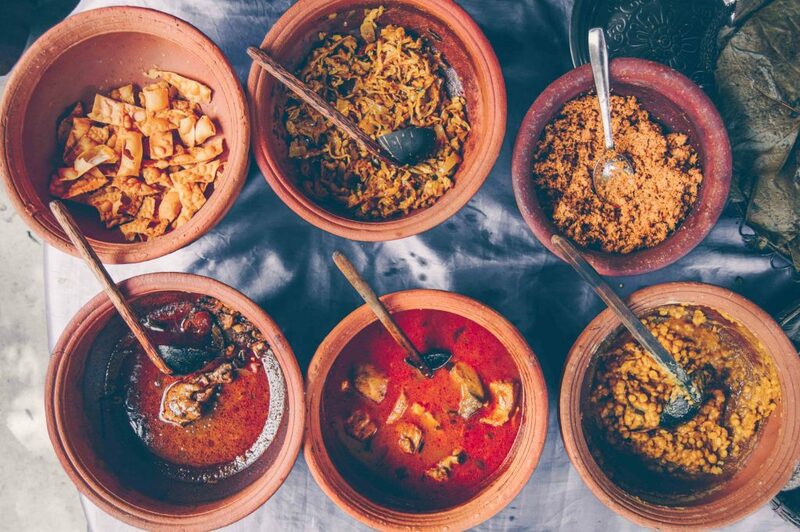 It might seem boring to have the same dish on a daily basis until you realize there are hundreds of curry varieties: chicken, fish, shrimp, carrot, beetroot or pumpkin – you name it. No less than three varieties will be served at one meal, but the number can go up to seven-eight. Mind you, they normally don’t repeat day in and day out. Rice and curry is generally prepared for lunch but it’s not uncommon to have it for dinner and in especially rare and weird occasions for breakfast. Don’t be surprised. Tip: Control your portion size if you want to stay in shape. If you blindly follow locals in their eating habits, you will end up with a mountain of rice on your plate. Start with a little bit of everything, you can always serve more if you are not full later. This is the first thing everybody warns you about: Sri Lankan food is spicy as hell. Spices are not only used to make curries. I was surprised to find out that slices of pineapples and mangoes spiced with chili make a great snack. 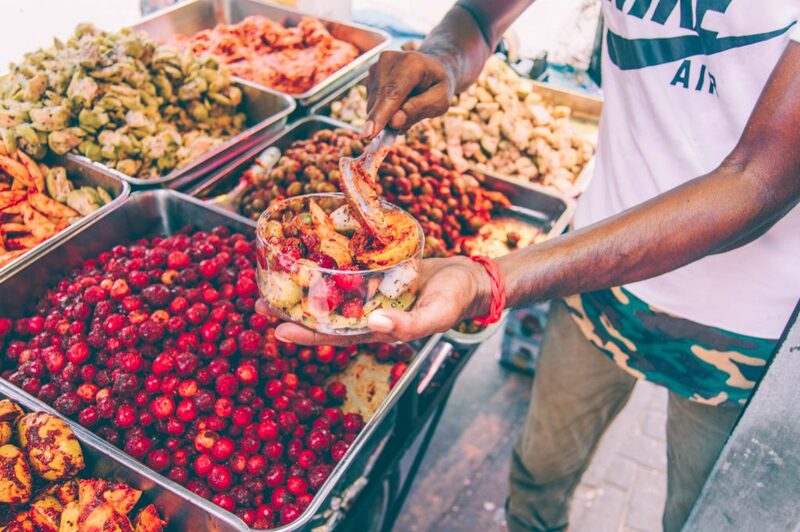 I personally find it odd to have sweet fruits mixed with spices, but Sri Lankans love it! Fruits and vegetables mixed with spices and pickled are called achcharu. 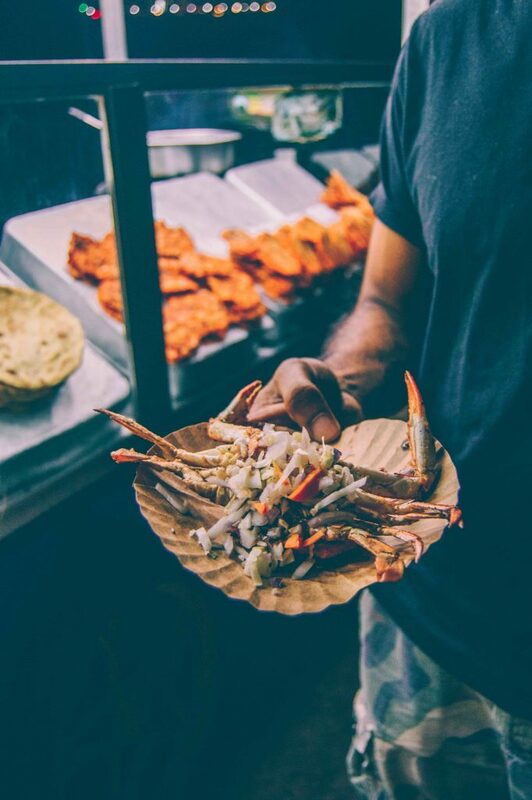 It is usually sold at the water front, markets or roadside kiosks. Tip: If you are not used to spicy food and would like to have lunch without tears and drama ask for “no spices”. Talking from my own experience: saying “less spicy” or “mildly spicy” does not work. Believe me, Sri Lankan “no spices” will be spicy enough for you. If you are completely intolerant to spicy food, your trip to this country might be quite a challenge since even “no spices” doesn’t guarantee some chili won’t magically find its way into your plate. 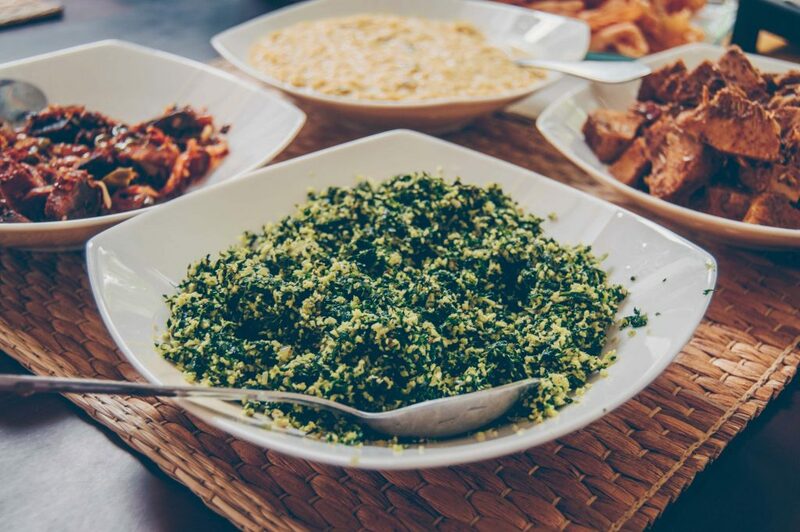 Mellum, a salad prepared of local leafy greens, mixed with grated coconut and lime juice. Mellum is served along with curries to accompany rice. Although Sri Lankans use a lot of vegetables in their kitchen, they are mostly cooked as curries. Fresh salads and grilled vegetables are quite hard to find. A leafy salad dressed with lime juice can be served as a side, along with rice and curries, but this is as far as it goes. Vegetables are never a main dish. By the way, soup is another thing that is hugely unpopular in Sri Lanka. 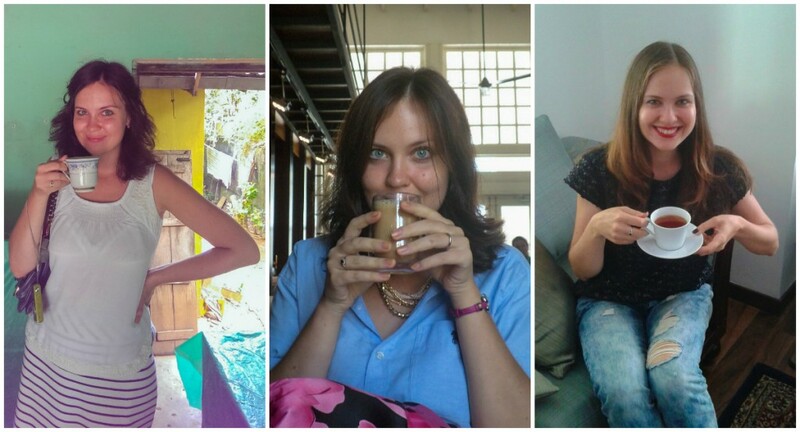 For a girl from Russia who normally eats soup on a daily basis that was hard to accept. Tip: There’s nothing you can do unless you rent an Airbnb and cook your own food. The first thing I do after my trips to Sri Lanka is prepare a big bowl of fresh vegetable salad! While you are on the island, enjoy the many delicious vegetable curries. My favorite are kos, potato, eggplant and green pea. Delicious perfectly ripe fruits all year round is a dream come true. And they are so cheap! Mangoes, pineapples, passion fruits, papaya and ten different varieties of bananas to start with. Jambu, jackfruit, guava, rambutan, woodapple and mangostin if you want to try something unique. Fresh fruits are commonly served at hotels for breakfast, but funny enough most of Sri Lankans wouldn’t eat a fresh fruit platter in the morning. 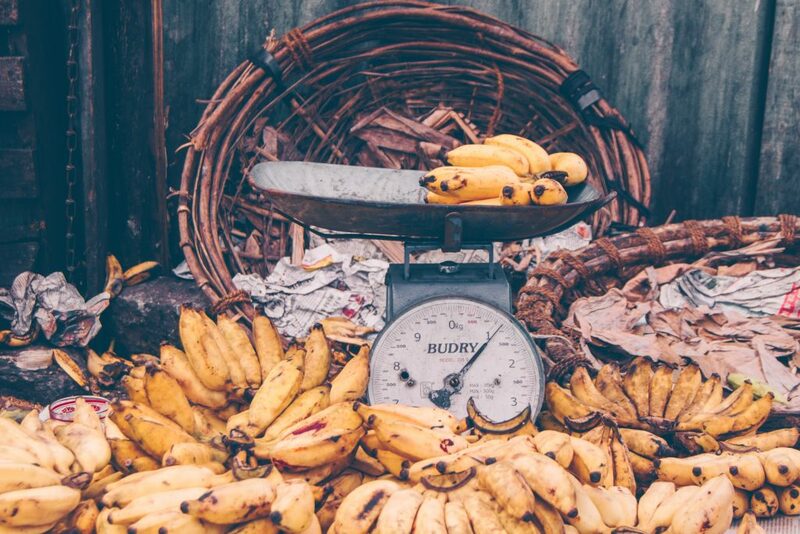 They might have bananas with kiribath (rice cooked in coconut milk) or a childhood favorite — bread with butter and banana, but never a fruit platter or yogurt with fruits which is so common in the West. Fruits are usually served as dessert after lunch or dinner. Tip: Buy fruits at the roadside shops instead of supermarkets. Fruit selection there is better and prices are lower. You will find these shops all around Sri Lanka, just ask a tuk-tuk driver to make a quick stop when you head to hotel. Granola bars? Hummus and veggie sticks? Nuts? Nah-ah! Pastries! The best snacks in Sri Lanka are so-called “short eats”: deep fried cutlets and patties, fish buns, roti (coconut flat breads) and samosas. A lot of carbs, a lot of fat, a lot of spices – no wonder they are delicious! Also no wonder I gained 6 kilos in the first 2 months in Sri Lanka: rice and curry for lunch and deep fried patties for snacks did their job. Update: some people rightfully commented that roti is more of a dinner or breakfast dish enjoyed with curry, rather than a snack. I love it so much that I eat it for breakfast, lunch, dinner and in between too. But not all locals do the same. Tip: Same as with fruits, you can find Lankan short eats at the roadside shops. Not only are they delicious, but cheap too which makes them irresistible. One pastry will cost you around Rs 50-100 ($0,5). Sri Lanka, or as it was formally called Ceylon, is a tea country. Have as much tea as you can while you are on the island, just follow the rules! if you are staying in a big hotel, tea will be served in a pot with milk and sugar on side. But if you find yourself in a small roadside shop or somebody’s house, most likely tea will be mixed with milk and sugar in a big pot and then served to everybody. The amount of sugar in your tea is directly-proportional to how happy the host is to see you in his house. Given that Sri Lankan people are very hospitable your tea is likely to cause a “sugar shock” as I refer to it. It’s very – I can’t stress it enough – very sweet! Tip: If you order “tea” in Sri Lanka, by default you will be served tea with milk and sugar. If you want simple black tea, you need to ask for “plain tea”. 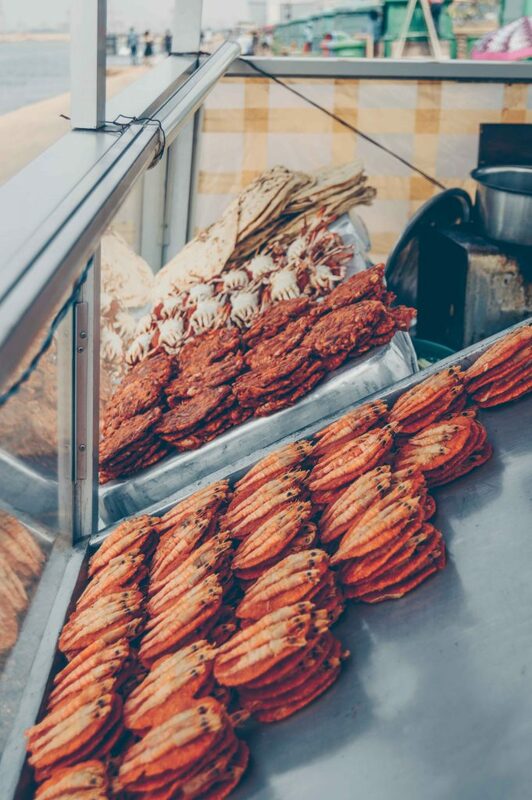 This should give you a first look into Sri Lankan food and prepare you for some surprises. if you want to learn more read my post How to Eat Like a Sri Lankan! Just two points I’m going to pick on, the second one because I felt your comment about coconut based fatty curries a little misleading. Pol roti doesnt really fall into the snack category, it’s the main carb as a part of breakfast or dinner. Not every vegetable or protein is cooked into a curry. We call everything a curry, but quite a few of them are basically stir fries. Some types of mild veg (kohl rani, snake gourd, beans) are only cooked for about five minutes in a light turmeric based sauce. Proteins are not always cooked in coconut milk (considering cost, but also because such rich food isn’t eaten day to day in a typical household, although severed in hotels and catering outlets as it adds flavour). Fish is cooked lighter in a vinegar base, deep or shallow fried, or even cooked into a water based (not coconut) red curry. We frequently cook chicken at home (bone in) with tomatoes and in a water base, although heavily spiced with roasted curry powder, the preparation is almost like a stew than what non south Asians typical imagine a heavy curry to be. Hey! Thank you for such a thoughtful comment, I appreciate it! I know roti is pretty common for breakfast and dinner (pol roti with pol sambol and parippu for breakfast is my all time favorite!) but I did snack on it in between meals occasionally, maybe it’s just me though, but it’s small and filling. Hey, I loved reading your posts about the visits & stays in Sri Lnaka. And love the pictures too. I just wanted to touch on the lack of salads & soups. yes, they aren’t as common or popular as in the western culture, but we do have some. For example, common salads are cucumber salad (cucumber/onion/green chile), tomato & cucumber salad, pineapple salad, and the typical salad platter that has (beets, carrots, cucumber, tomato, & onion , all sliced on a bed of lettuce (Lillo Rosso lettuce). Besides those Gotokola sambal is a salad & other green mallums such as mukunuwenna, kathurumurunga etc..are lightly warmed with coconut and are sort of equavalent to the salads of the west, although not the same. That way, I think Sri Lankan cuisine is pretty healthy & full of vegies considering each meal consists of at least 2 vegie curries & a sambal/mallun or a salad. Hey Sha! Thank you for the kind words to my blog! I guess we learn everything in comparison. Coming from Russia, where fresh veggies and salads are the core of the local cuisine, I always felt like I am lacking it in Sri Lanka. I guess the difference is that in Russia we eat salad as a main dish, while in Sri Lanka it’s a side dish so you get just a bit of fresh vegetables along with carbs, protein, and so on. I always felt that Sri Lankan rice and curry is healthy and well balanced (as long as you don’t eat a mountain of rice :D), but that fresh veggie thing is just my personal opinion since I grew up eating differently. Thank you for following along on my foodie journey and I do appreciate your comment since I still have a lot to learn about local cuisine!